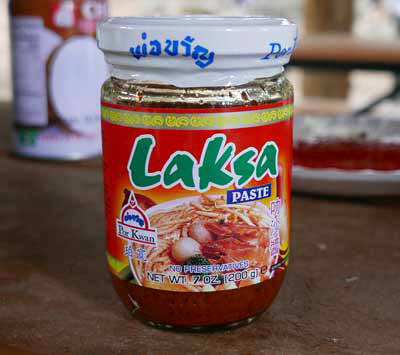 Laksa paste is the foundation of the Malaysian (and Singaporean) curry laksa. It's a mild curry with lots of flavor and low chile heat. There are good instructions on the label regarding how to prepare it. All you need to do is add coconut milk, water and the meat of your choice. We recommend serving over rice stick noodles and shredded vegetables (see pictures below). Packed in a glass jar, in well-known Por Kwan brand. Ingredients: soy bean oil, onion, garlic, water, galangal, salt, coconut milk, shrimp paste (shrimp, salt), lemongrass, tartaric acid, sugar, chili, peanuts, msg, citric acid, paprika color. Our Version: Simply heat the laksa paste with water and coconut milk (directions on package). Add chicken (and tofu if you prefer) and simmer until cooked. Separately, prepare chantaboon rice stick noodles and place in a bowl, then pour the laska over noodles. Garnish with shredded carrots, radiccio, cilantro, etc. Enjoy!